No trip to Oahu would be complete without visiting Hawaii’s most popular tourist attraction … the USS Arizona Memorial. 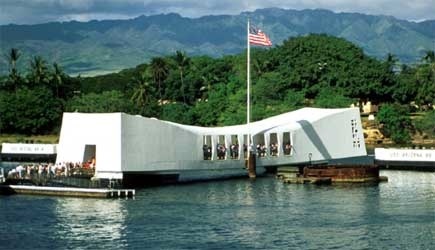 The Arizona & Missouri with Punchbowl tour, aka Pearl Harbor Remembered, includes the Arizona Memorial visitor’s center, documentary film, and the ferry boat ride which takes you out to the memorial. From there you will gaze down into the water where just below the surface lies the decks of USS Arizona, final resting place for many of the 1177 crew members who lost their lives on December 7, 1941. There are many large tour buses that bring guests to Pearl Harbor, but this tour is superior to the big bus tours because these excursions are all done in smaller 25 passenger mini-coaches. This gives each guest more personal attention from the guide, and the oversize windows in these mini-coach vehicles offers superior visibility. This tour takes you to the beginning and ending of World War II. You’ll watch the documentary film and board the ferry for the ride out to the Arizona Memorial, which represents the beginning of American involvement in the war. You’ll also have a chance to visit the USS Oklahoma Memorial, which stands as a monument to the 429 sailors who died when this ship capsized during the attack on Pearl Harbor. 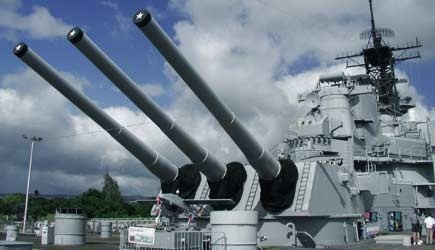 You will also participate in a guided tour of the USS Missouri, a battleship of the same class as the USS Arizona. The USS Missouri was the scene of the end of World War II as the Japanese signed formal documents of surrender aboard this ship in Tokyo Bay on September 2, 1945. You will see a copy of the Declaration of Surrender on the exact spot where the document was signed. You will continue downtown with a narrated Honolulu City Tour. A drive through the National Cemetery of the Pacific at Punchbowl Crater completes this very popular and very moving tour. Schedule: Daily. No tours on Thanksgiving, Christmas, New Year’s Day, and Pearl Harbor Day (Dec. 7th). Pick up: Early morning tour pick up is between 6am and 6:20am, and approximate return is 1:00pm. Late morning tour pick up is between 9am and 9:30am, and approximate return is 4:30pm. Reservations: Due to smaller group sizes these tours should be arranged well in advance of your arrival in Hawaii! What to Bring & Wear: Tour participants should wear respectful attire (shoes must be worn and no swimwear allowed). Due to heightened security no bags, purses, or strollers are permitted at the Memorial. Storage of these items is available for a nominal fee. Cameras and small, hand-carried wallets are permitted. Because Ko’olina is on the other side of Pearl Harbor from most Oahu hotels (in Waikiki), the regular Pearl Harbor tours do not pick up there. Enoa has added a special tour with Ko’olina hotel pickup with $10 per person extra on Sunday, Tuesday, Wednesday, and Friday. If you are cruising on the Pride of America and spending the night at a hotel in Waikiki prior to your cruise, you can do the Arizona & Missouri with Punchbowl tour on the same day that you board your NCL cruise ship. If you are on a cruise that visits Honolulu just for the day, this tour starts too early for you to participate. One tip for photographing the memorial … when you are re-boarding the boat for the return to the vistor’s center, try to get in the last row. As the boat pulls away from the Arizona, you will get your best photo from there. This particular tour hits the highlights at Pearl Harbor, including the USS Missouri which is a decommissioned battleship docked next door to the Arizona’s final resting place. Walking around on deck of the Missouri and seeing its giant guns gives you a humbling perspective of the scale of the loss that happened when the Arizona was destroyed and sunk at the next mooring.